Yesterday I came across an article on eMarketer that showed that Behavioral Targeting brings clear benefits to publishers. However when consumers are asked about Behavioral Targeting or data collections by websites they seem to dislike it. It is clear from the first chart that behavioral targeting is working for everybody i.e. publishers, advertisers and consumers. If it were not working for consumers then publishers would not charge premium for it and advertisers would not pay premium for it. So why are consumers so concerned? As I have stated before the biggest issue seems to the lack of consumer education and the perception of behavioral targeting. Anybody will get concerned if you tell them that the websites are collecting too much personal information about them. The issue here is how the question is framed and the context it is posed in. If asked in a different way the responses would be different than shown in the chart above. Let’s see how the answer will differ based on the questions asked. What do you think the answer will be to the following questions? Do you like to be targeted? Do you like that the websites collect a lot of personal data about you? Do you like to save you money on things you buy online? I am sure the answer will change from Hell No, to Yes. We might also use your gender, age range etc. also to make sure you receive the right offers and message. You already have provided this to us and there is no need for any further action from you. Will that be ok? …Sure go ahead or maybe will be the answer. Net results “No one wants to be targeted but they want the benefits” and seems like that value proposition is not clear to the consumers, the word "Targeting" gets them very concerned. Behavioral Targeting should be renamed with a more consumer focused name. Marketers understand “Behavioral Targeting” but this name sounds too negative for consumers. Educate consumers about online advertising and how using behavioral attributes helps consumers. Looking to fill your Web Analytics or Online Marketing position? Post your open jobs on Web Analytics Job Board. 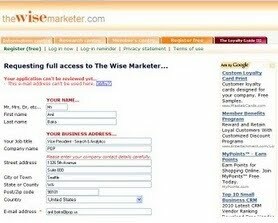 Forms are everywhere on the internet, some convert great while other don’t. There are several factors such as call to action, images, copy etc. that all contribute to the success of a form. However, even a well designed form might not convert well if some fundamental things are not taken care of. In this post I am listing 5 fundamental things that could be preventing the visitors from converting. Consistency in Call to Actions – Consistency in call to action is critical for conversions. You cannot underline few links and not the other within the same context. Be consistent with your formatting. Making some links underlined while other not underlined makes user think harder than he/she should and increases the chances of bailout. See below; do you see the inconsistency in the links? 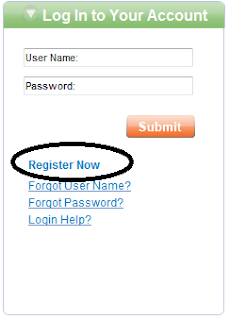 I almost gave up on finding that “Register Now” link (yes it is obvious now because I have highlighted it). 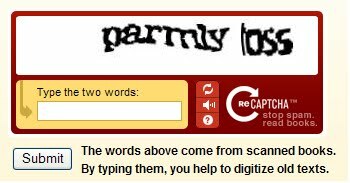 Captcha – Captcha is meant to stop automated computer programs (spiders) from filling the forms but do you know that a Captcha can also deter people who are genuinely trying to fill your form? I suggest doing a simple A/B test on your form with a captcha and without a captcha to see if you captcha is eating up your conversions. This will help you determine if the captcha is worth the loss in conversion. 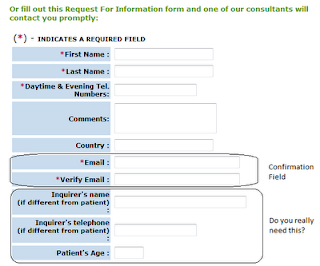 Confirmation Fields – Confirmation fields are the field that require users to fill in the same information again to ensure that user that has not mistyped the information e.g. password, email etc. However, confirmation adds one extra field that the user has to fill in, thus coming in the way of conversion. 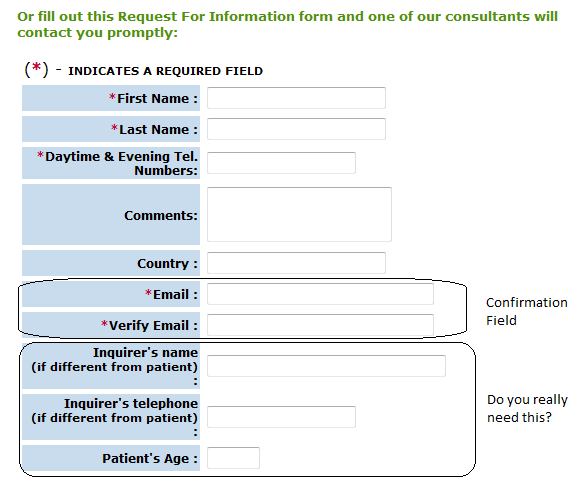 Take a close look at your confirmation fields and determine if you really need them. For example, is it really required to have the user confirm the password? If the user has mistyped the password during registration then won’t she be able to easily get it via “Forgot Password?” link? If yes, then do you really need to confirm the password during registration? Do you really need confirmation on sensitive information such as social security? It is scary (for most people) to provide social security number online and confirming it again just gives users another chance to bail out. Data Fields – It appears to me that many companies like to collect the data just for the sake of collecting it without thinking how it will be used. Yes every piece of data you collect can eventually provide you more information about your customer but should it be really on your form at the expense of lost conversions? Your customers have limited time and adding more fields on your form might turn them away. Go through your form and remove any unwanted fields. If you don’t want to remove anything at this point, identify the fields and do a simple A/B test (one version as it is and the other one without those fields) to see how your conversions are getting affected. Twitter has grown leaps and bound in last 4 years and now has over 190 Million members worldwide. Many companies have now jumped into using twitter as a means to provide customer support. Why? Well because more and more people are getting on twitter and it is way less expensive then phone support. Recently I turned to twitter for help with one my services. There were two main reasons for me to turn to twitter 1. publicly complain about the company because I was not happy with the service and phone customer support 2. I was hoping that someone at the company will pay attention and get back to me. I achieved both. I was pleasantly surprised to find that these guys were paying attention and immediately responded. So how was my experience? Well not much better than phone support. Though the twitter support agent tried her best but she was limited by the process and to some extent the technology. I think twitter could be a great customer support tool. However, we have a lot to learn. If companies want to use twitter as a viable customer support channel then they should be willing to pay attention to what is being talked about their customer support and brand and learn from their mistakes. Based on my experience, I have outlined 5 tips that can help companies provide better customer support on twitter. Knowledge - Have similar knowledge of your products and offers as your phone counterparts have. It is frustrating to hear different answers from two different channels. Not knowing who is wrong and who is right adds to the customer dissatisfaction. Whatever you say or mention on Twitter is going to be indexed by twitter, search engines and many 3rd party tools and will be there forever. So if you give wrong information via twitter it can and will be used against you. So you don’t want interns to run you Twitter customer support. Expectations - Answer tweets promptly or set clear expectation about when the customer can expect a reply back. Every second a customer has to wait adds to the customer’s anxiety because he/she is not sure if you got their tweet or not. With phone support you know that there is a live person at the other end. With email there is an expectation that it will take a day for someone to respond or you can send an auto response. With twitter customer expect immediate answers. Live up to those expectations or set them properly upfront else twitter customer service can backfire. Resolution - If you can’t resolve an issue in 5 tweets then have a customer support agent follow up by phone or offer to send a DM when the issue is resolved. You get thousands of tweets in a day and it is hard for you to respond each of those and resolve them in 140 characters. Remember not everything can be solved and should be solved via twitter. Set up a proper escalation process. At least for now, twitter cannot replace the live conversation or in person resolution experience and satisfaction for every single issue. Timeliness - Do not leave anything to the next day. You cannot go home without solving an open issue. Pass those issues to the next rep or hand them over to phone support. Since tweets are most likely not getting tracked in a CRM system as your phone or email support is, it is hard for you to remember the previous conversation and it is really annoying for the customer to explain everything again the next day. Ideal solution will be to track all your tweets in your CRM system. I personally had to explain my case 3 times to the same customer support agent because it was not resolved on time and each time I had to start over again. Information – Do not ask anything that is not required. You are dealing with 140 characters so limit the information that customer has to provide. If a customer provides you with her phone number/account number etc. you don’t need to ask her details about the products she has bought or the service she is subscribed to. All that information should already be in your CRM system. Most of the customers don’t know what products or services they have bought all they know is that something is not working when it should. Use your CRM system to find detailed information about that customer and the products/services they have. Remember, twitter (or any social media) is a new platform for customer support and it will take time before you can have a proper process and everything worked out. You should be prepared to take criticism and learn from the criticism because there were will be people who will write blog posts and tweet if your twitter customer support does not meet their standards. Hope this helps. If you have a customer support story then leave it as a comment. Email open rates and click through rate have both declined over recent month as reported by eMarketer (Avg. Open rate is 11.2% while Avg. CTR is 1.6%). This seems like a bad news for emails. What is going on? Is Social Media responsible for this decline or are there other reasons? Who knows what the future holds for email marketing but for now email is alive and marketers can improve both the open rates and click-through rates by just doing a little bit more than they are currently doing. The key to email success is giving customer what they want and in a format that they want. Nothing revolutionary but something that’s often forgotten in email marketing. To address the first point, read my blog post “ 7 Ways to Create Relevancy in Emails. In this post I am addressing the 2nd point i.e. Testing. Below are 15 things that you should test in your email campaign. Below are the 5 things to test to improve the open rate of your email newsletter. Below are the 10 things to test to improve the click-through rate of your email newsletters. Fonts and formatting of titles, text etc. Left and right placement of the links, stores etc. Anchor text length in links – Do people click on longer links more than shorter links? Action words v/s non-action words in hyperlinks e.g. Does “Download Now” works better than “you can download the whitepaper”? Keep in mind that if you don’t give customer what they want then it will first show up in dropping click-though rates, leading to lower open rate and finally resulting in unsubscribes and demise of your email marketing. Past weekend, WSJ published a story titled Web’s New Gold Mine: Your Secrets on online tracking and advertising (behavioral targeting). It appears to me that the author of this article is either confused between malware and cookies is or she is just doing what she is supposed to do to sell the story i.e. using words that instill fear in people. The article projects any tracking, business and advertisers do to serve relevant ads or personalize the users experience on web, as malicious. Businesses have been trying to understand consumer preferences and then make personalized recommendations ever since the humans existed. We do it offline all the time. So how is online tracking for the same purpose malicious? My dad used to run his clothing store in India, way before internet existed. He used to gather all the information (in his brain) about consumers browsing and purchase behavior to make personalized recommendation to existing customers and new customers. He used all that information to determine what products, colors, sizes, quantities etc. to stock. He knew almost all of the existing customers by their name and what they preferred. Was that spying? Nope. Customer loved it. If someone can understand me and provide me exactly what I want then why won’t I like it? If they miss the mark well then I have a choice of not paying attention to them. Do you know that Visa, MasterCard and American express have more information about you than any cookie or advertising company has? Your super market collects your information and tries to guess about what you might buy next. Have you ever got a coupon from an automated coupon dispenser when you check out from your local super market? 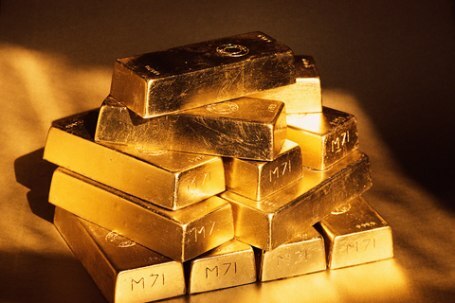 Well do you know that it is based on your current and past purchases, you zip code etc? Do you ever worry about that or happily walk away with the coupon? Why is the fuss about online tracking for the same purpose? Don’t you love personalized recommendations from Netflix or Amazon? In my opinion advertisers/publishers/network should invest in consumer education and make tracking and targeting more transparent and articles like this should help with the education instead of branding all tracking as bad.